Passing through Berwick-upon-Tweed on the East Coast train from London to Edinburgh, or driving up the A1 to the Scottish capital is the way most folk come north from northeast England. 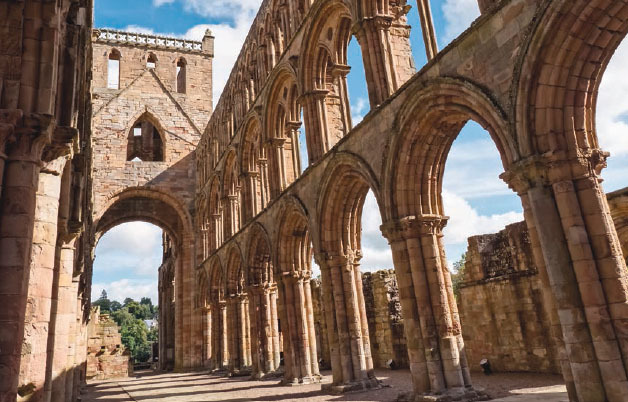 Perhaps that helps preserve the scenic beauty and local charms of the Tweed Valley, the famous Border Abbeys of King David I and “Sir Walter Scott Country.” There is an incredible amount to see in a small area just a short drive west through the vale of the River Tweed from Berwick. LET’S START from Berwick-upon-Tweed, whether arriving there by train or car. The ramparts of Berwick’s town walls and castle evidence its turbulent past. Guarding the mouth of the River Tweed, the border town has changed hands several times over the centuries (settling now just within England). It’s worth taking the time to explore its old streets a bit—and collect some great photography. The A698 leads west into Scotland following the River Tweed. Cross the river south to north at pretty Cold-stream, birthplace of the famed Cold-stream Guards, oldest regiment in the British Army. Time and interest allowing, you might detour just a few miles south on the A697 to the site of the 1513 Battle of Flodden Field, the largest ever fought between England and Scotland—and a decisive defeat for the Scots. From Coldstream, it’s 10 miles along the river to the market town of Kelso (population circa 6,000). Kelso makes a great base for two nights at least. Uniquely in Britain, four cobbled streets lead into a cobbled market square. You might stay on the Square at the Cross Keys Hotel or the nearby Ednam House Hotel on Bridge Street (both 3-star). Pubs and dining options abound. KING DAVID I founded four abbeys in the Borders during the mid 1100s, each a different order and in relatively close proximity to each other. The richest of these was Kelso Abbey. Though relatively little of the abbey remains, its well-maintained ruins sit in a garden in the middle of town, convenient to begin the day. This afternoon you might take an excursion 10 miles southwest on the A698 to Jedburgh. The abbey church of the Augustinian abbey is roofless, but its magnificent nave still stands complete in the heart of town. King Alexander II was married here in 1285. TODAY, WE PICK UP THE TRAIL of Sir Walter Scott. A good place to begin is a visit to Smailholm Tower, just a few miles from Kelso. It is a classic example of a pele tower, many of which were built on both sides of the border in the 1400s. These fortified houses or keeps on rising ground protected border families against the depredations of the violent reivers or border raiders. Smailholm once belonged to Scott’s grandfather and the poet and novelist spent part of his boyhood here. Thread south a few miles toward Newton St. Boswells to visit Dryburgh Abbey on the River Tweed. Many consider Dryburgh the most romantic such ruins in Scotland. Scott is buried in the north transept of the abbey church. Take the signposted road on the north side of the Tweed to the Wallace Monument. It’s worth the short walk to the base of the giant sandstone statue. Just a bit further on, you’ll come to “Scott’s View,” overlooking the Tweed Valley and the Eildon Hills—known to be a favorite scene of the writer’s. Distances are modest. It is only a dozen miles or so back to Kelso. You might comfortably decide to complete your stay there. Alternatively, you can shift your flag and continue on another 10 miles for a stay in the pretty small town of Melrose. There are several hotels on the Market Square and High Street. Both the 3-star Townhouse and Burt’s Hotel are both lovely stays in sight of Melrose Abbey. THE VILLAGE spreads out along the Tweed from Melrose Abbey at its center. Best preserved of the border abbeys, the Cistercian monastery is considered among the finest ruins in Britain for its architecture, setting and well-preserved sculpture. The heart of Robert the Bruce is buried in the churchyard. TIME PERMITTING, you might take a day to visit Selkirk, one of the region’s oldest towns. William Wallace was declared Guardian of Scotland here in the parish church, and Scott served as county Sheriff based at the courthouse. Then, just up the road is Galashiels, largest town in the Borders (population circa 15,000) and commercial hub. Galashiels was a textile town, and Herriot-Watt University’s School of Textiles and Design carries on its heritage. From Galashiels, it is an hour’s drive north on the A7 to Edinburgh.